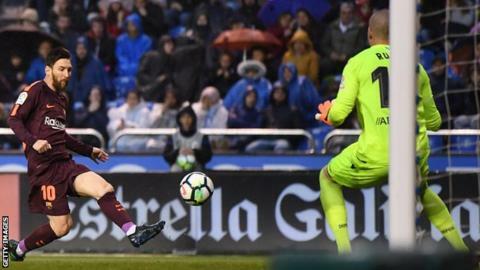 Barcelona wrapped up the league title in Ernesto Valverde's first season as manager with a Lionel Messi-inspired victory over Deportivo La Coruna. Messi scored a hat-trick at the Riazor to give Barca an unassailable lead at the top of the table. Barcelona had led 2-0 with goals from Philippe Coutinho and Messi but Depor fought back to 2-2 with strikes from Lucas Perez and Emre Colak. Messi then struck twice in the final 10 minutes to seal the win. This is the 25th time Barcelona have won La Liga - eight behind the 33 won by rivals Real Madrid. They are only four games from an unbeaten La Liga season. Do Barca need change for European glory? Coutinho had put Barca ahead with a curling effort and Messi doubled the lead when he volleyed in at the back post following a sublime cross from Luis Suarez - who assisted all of Messi's goals. Depor refused to give up though, and Arsenal loanee Perez pulled a goal back with a first-time shot before Colak swept past Barca goalkeeper Marc-Andre ter Stegen following a fine team move. Argentina international Messi ensured the title was won with a flourish as he notched his 46th hat-trick for club and country. The 30-year-old produced two composed finishes from close range to secure the victory and ensure Depor's relegation. Messi might be sad to see them go having scored 13 goals at the Riazor, his favourite ground alongside Real Madrid's Bernaebu. Lionel Messi leads La Liga this season in goals (32 goals), assists (12), chances created (81) and secondary assists (passes leading directly to an assist: nine). A degree of scepticism greeted Barcelona's decision to appoint ex-Athletic Bilbao boss Valverde in May 2017. However, the 54-year-old has delivered the Spanish league title in his maiden season. It is the second piece of silverware in the trophy cabinet at the Nou Camp this season following from Barca's emphatic 5-0 victory over Sevilla in the Copa del Rey final. However, there will be no European glory this season following Barca's dramatic exit to Roma in the Champions League last month. Barca conceded a 4-1 quarter-final first-leg lead as they lost the second leg 3-0 in Italy. That will be Valverde's target next season having seen domestic rivals Real Madrid win the past two European Cups. They are on course to reach this year's final in Kiev. The match was the first since midfielder Andres Iniesta announced his decision to leave the Catalan club at the end of the season. The 33-year-old began the match on the bench after being named among Barcelona's substitutes by Valverde. Iniesta's arrival on the pitch in the 87th minute was greeted by a standing ovation from both sets of fans. Next Sunday will be his final chance to play in El Clasico when Real Madrid visit the Nou Camp. After that there is a home game against Villarreal and a trip to Levante before the curtain is brought down on his Barca career with Real Sociedad the visitors to the Nou Camp on 20 May. Match ends, Deportivo de La Coruña 2, Barcelona 4. Second Half ends, Deportivo de La Coruña 2, Barcelona 4. Attempt blocked. Florin Andone (Deportivo de La Coruña) right footed shot from the right side of the box is blocked. Assisted by Lucas Pérez. Attempt missed. Denis Suárez (Barcelona) right footed shot from outside the box is close, but misses the top right corner. Assisted by Lionel Messi. Attempt saved. Gerard Piqué (Barcelona) right footed shot from the centre of the box is saved in the centre of the goal. Assisted by Luis Suárez. Corner, Deportivo de La Coruña. Conceded by Gerard Piqué. Attempt missed. Fabian Schär (Deportivo de La Coruña) right footed shot from the centre of the box misses to the right. Assisted by Emre Colak. Attempt missed. Florin Andone (Deportivo de La Coruña) right footed shot from the centre of the box is too high. Assisted by Lucas Pérez with a cross. Substitution, Deportivo de La Coruña. Florin Andone replaces Celso Borges. Substitution, Deportivo de La Coruña. Fede Cartabia replaces Borja Valle. Goal! Deportivo de La Coruña 2, Barcelona 4. Lionel Messi (Barcelona) left footed shot from the centre of the box to the bottom left corner. Assisted by Luis Suárez. Substitution, Deportivo de La Coruña. Sulley Muntari replaces Guilherme. Goal! Deportivo de La Coruña 2, Barcelona 3. Lionel Messi (Barcelona) right footed shot from very close range to the bottom right corner. Assisted by Luis Suárez. Attempt saved. Luis Suárez (Barcelona) right footed shot from the centre of the box is saved in the centre of the goal. Corner, Barcelona. Conceded by Luisinho. Fabian Schär (Deportivo de La Coruña) wins a free kick in the defensive half. Attempt missed. Guilherme (Deportivo de La Coruña) right footed shot from outside the box is high and wide to the right. Assisted by Lucas Pérez. Attempt missed. Michael Krohn-Dehli (Deportivo de La Coruña) right footed shot from outside the box misses to the left. Assisted by Emre Colak. Substitution, Barcelona. Paulinho replaces Coutinho. Juanfran (Deportivo de La Coruña) wins a free kick in the defensive half. Attempt missed. Luis Suárez (Barcelona) left footed shot from a difficult angle on the left is close, but misses to the left. Assisted by Lionel Messi. Attempt blocked. Lucas Pérez (Deportivo de La Coruña) with an attempt from very close range is blocked. Assisted by Emre Colak with a cross. Corner, Deportivo de La Coruña. Conceded by Nélson Semedo. Attempt saved. Fabian Schär (Deportivo de La Coruña) header from the centre of the box is saved in the bottom left corner. Assisted by Emre Colak with a cross. Corner, Deportivo de La Coruña. Conceded by Sergio Busquets. Attempt blocked. Guilherme (Deportivo de La Coruña) left footed shot from outside the box is blocked. Corner, Deportivo de La Coruña. Conceded by Jordi Alba. Michael Krohn-Dehli (Deportivo de La Coruña) wins a free kick in the defensive half. Goal! Deportivo de La Coruña 2, Barcelona 2. Emre Colak (Deportivo de La Coruña) left footed shot from the centre of the box to the bottom right corner. Assisted by Celso Borges. Attempt missed. Samuel Umtiti (Barcelona) header from the centre of the box is just a bit too high. Assisted by Ousmane Dembélé with a cross following a corner. Attempt blocked. Lionel Messi (Barcelona) left footed shot from the left side of the box is blocked. Assisted by Luis Suárez. Attempt blocked. Luis Suárez (Barcelona) right footed shot from the left side of the box is blocked. Assisted by Coutinho.